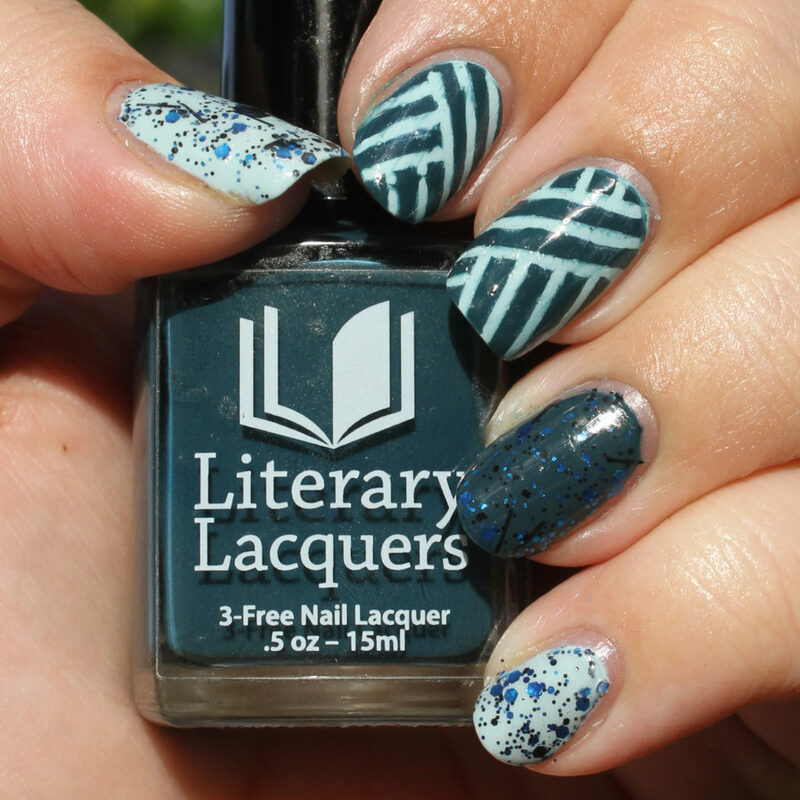 Manicure Monday this week was amazingly fun. 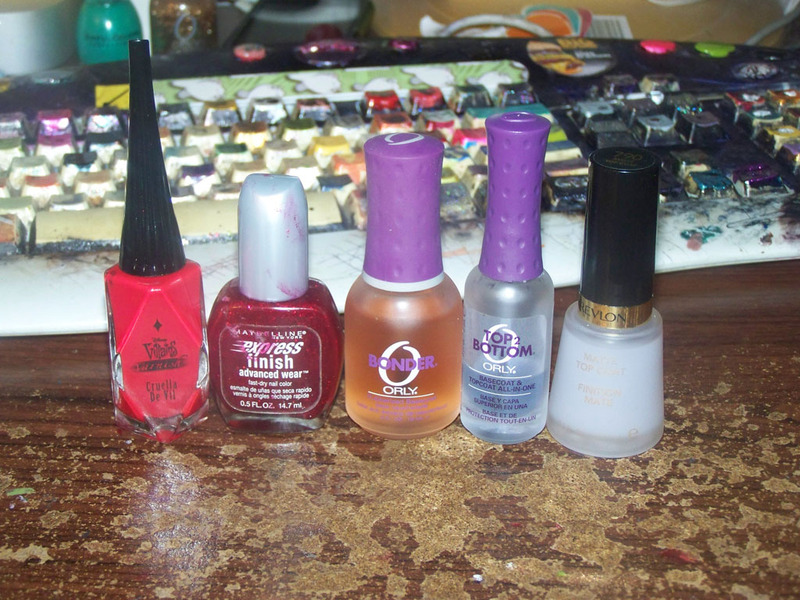 I’ve got two polishes that, at first, don’t look like they would pair together well at all. Somehow, though, it works. 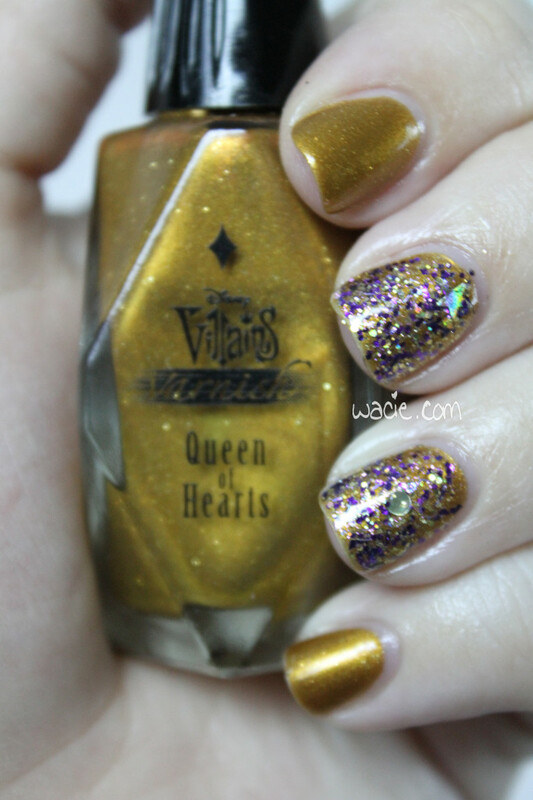 I’ve got on three coats of Disney Villain Varnish Queen of Hearts, with Digital Nails’s When Life Gives You Lemons as an accent. Photos were taken in the studio and outdoors. When I think of the Queen of Hearts from Alice in Wonderland, I don’t think of gold. Just saying. Regardless of what villain this polish was meant to evoke, it’s a beautiful rich, warm gold with tiny microglitters. 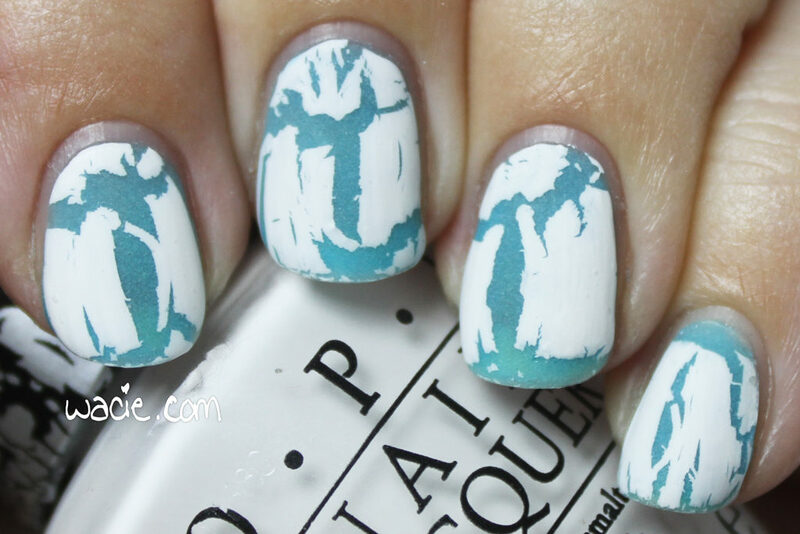 It takes three coats of achieve full opacity, but the application is smooth and easy. I kind of feel bad that I don’t use it very often. This is the first time I’ve used it as the main color in a manicure, and I didn’t realize what a beauty it is. It’s totally gorgeous. 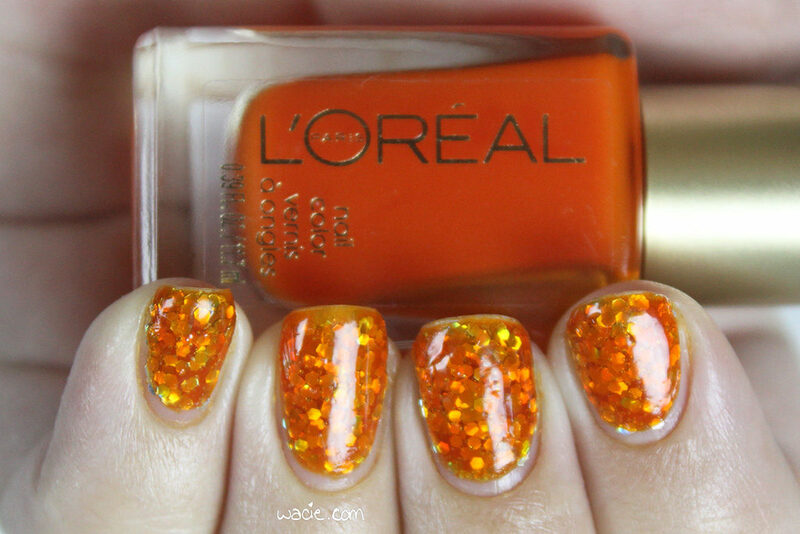 When Life Gives You Lemons is a Digital Nails glitter. I feel like that’s all I need to say. 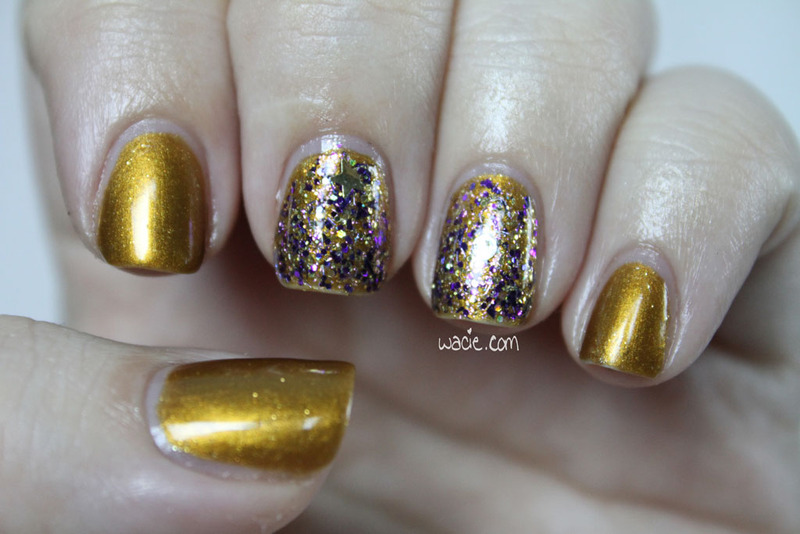 It’s a clear base with an impressive show of purple and gold glitters, yellow holo dots and stars, tiny bar glitter (which I actually didn’t notice until I was reviewing my photos), shreds, iridescents…. 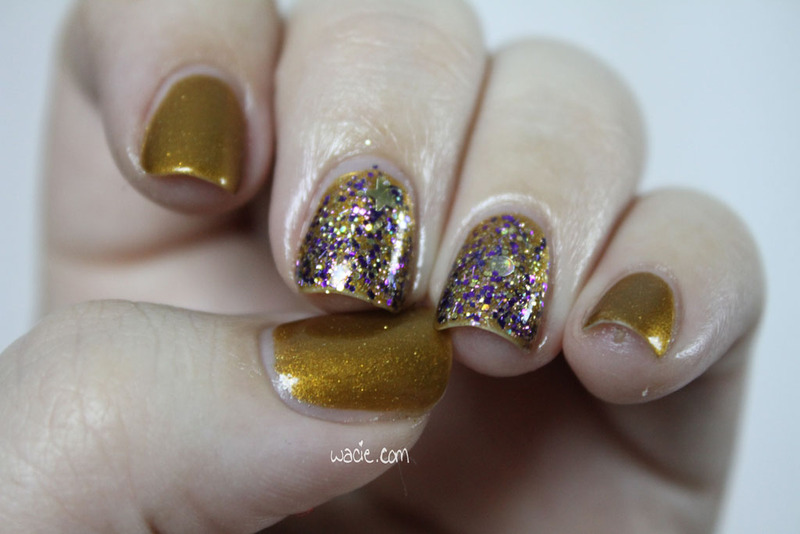 The sheer amount of glitter in this bottle should be overwhelming, but isn’t. It spreads smoothly and evenly, even the large shapes. It’s also incredible in the sunlight. While I’m not sure where you can still find the Villains Varnish collection, Digital Nails still has a few bottles of When Life Gives You Lemons in their etsy store. (It feels really good to review something that’s still available, for once.) The price is a bit higher than usual, but it was created as a charity item, with the profits from each bottle going to Alex’s Lemonade Stand, and will fund cancer research. 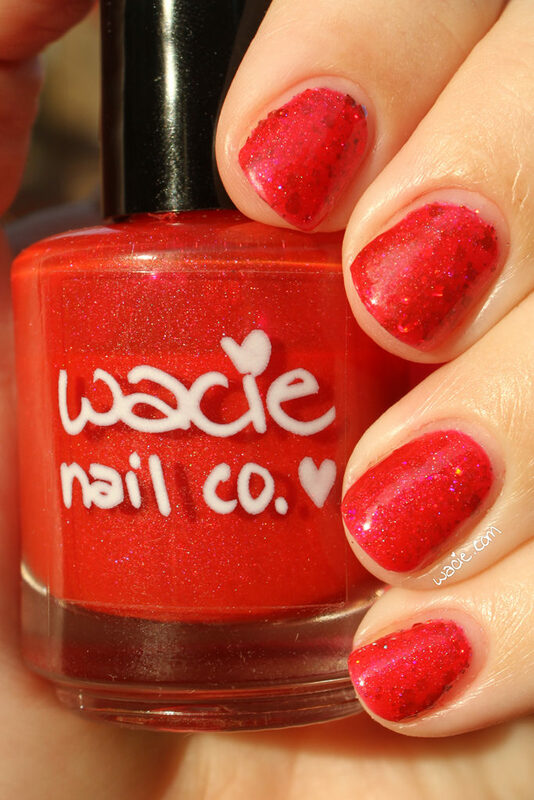 To date, this and its sister polish, I’m a Survivor, are the most expensive polishes I’ve ever bought, but I know I bought more than nail polish; I bought a little bit of hope. 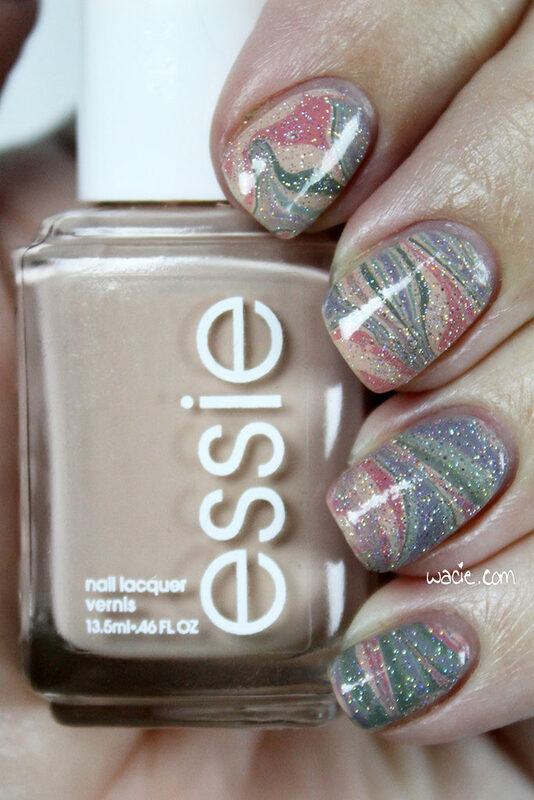 This week’s Manicure Monday was so much fun! I know I’m going to hate taking this off in a couple of days. I rarely get to do jelly sandwiches, so I’m happy about having the chance, and doing something besides slapping glitter down on polish and calling it art. 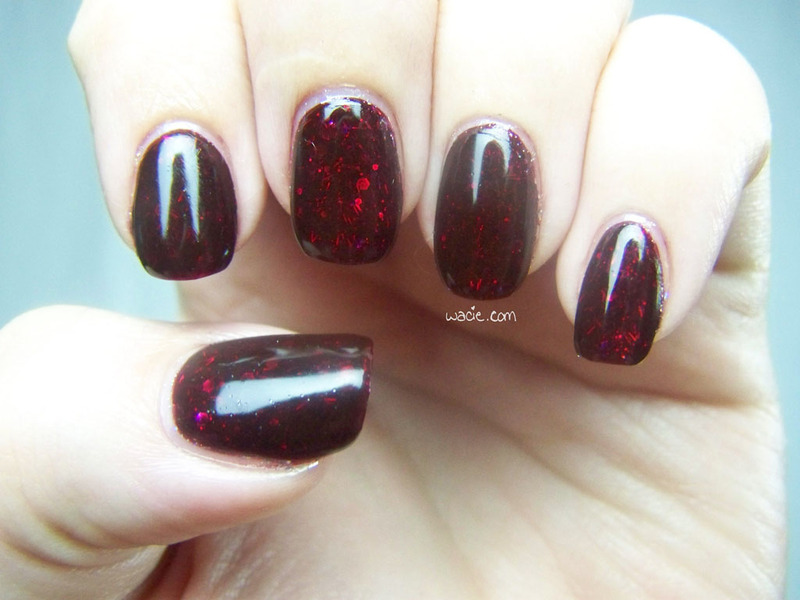 Today, I’m wearing two coats of OPI’s Which is Witch? between coats of Disney Villains Varnish Mother Gothel. 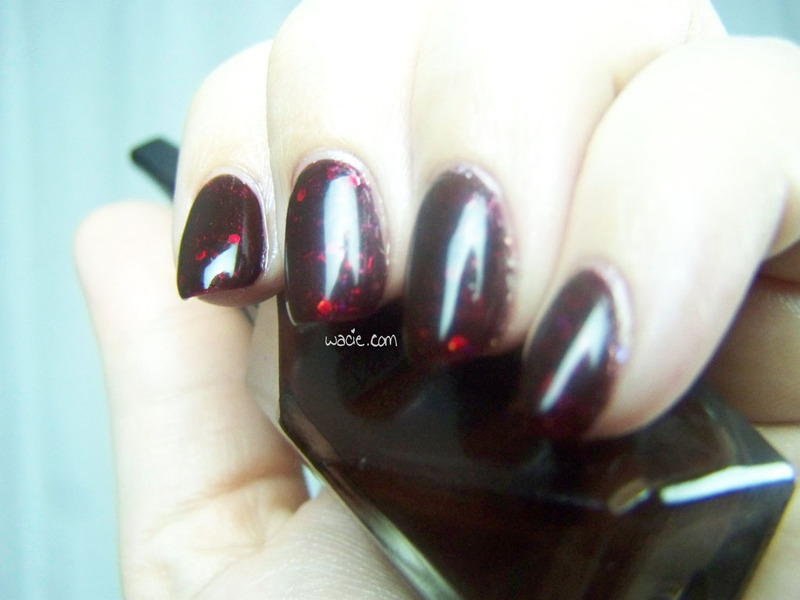 Mother Gothel is a deep burgundy, and when I got it, I had no idea it would make a jelly sandwich like this. 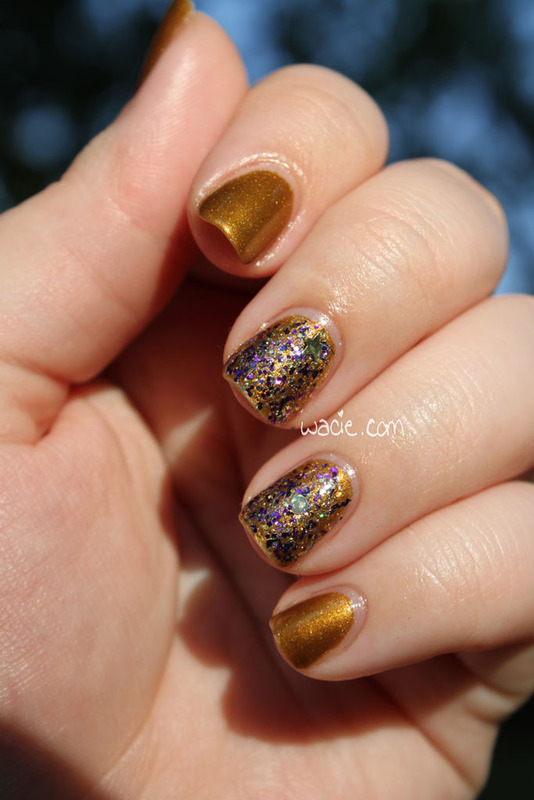 I swatched it once and I put it away until I started playing with it, planning a future manicure with it. I don’t remember when or how I decided to see what it looked like over glitter, but after I saw it, I couldn’t not do it. 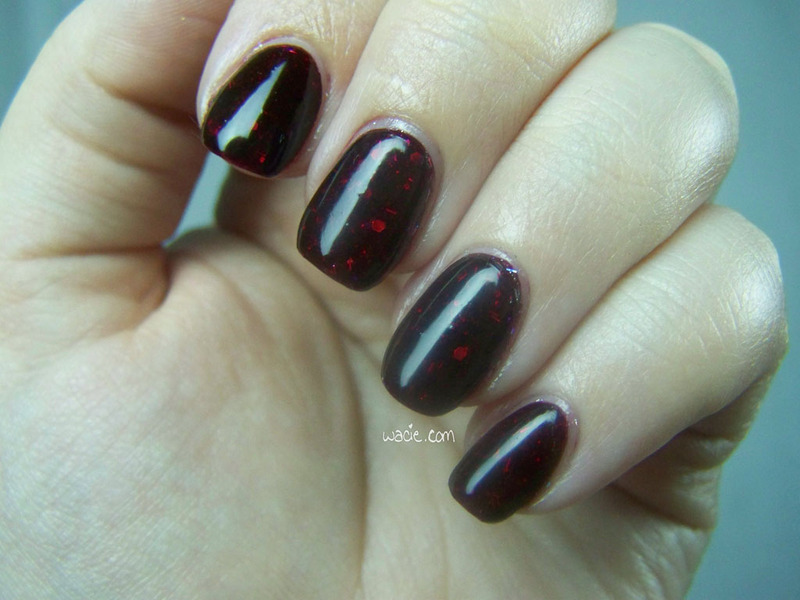 To me, this is the perfect translucence for a jelly sandwich: you can still see the holo shine from the glitter, but not the glitter itself. This is a look I love a lot. 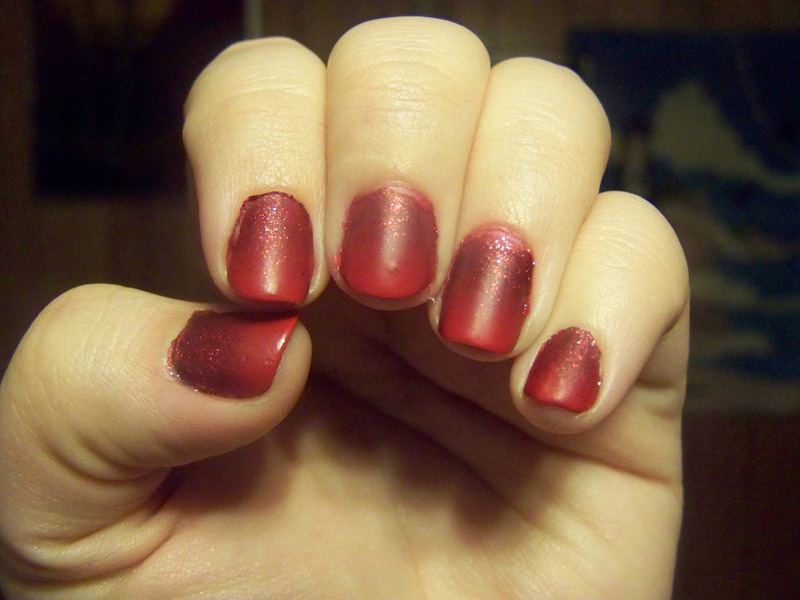 On its own, Mother Gothel is very shiny, like it could do without a top coat shiny. 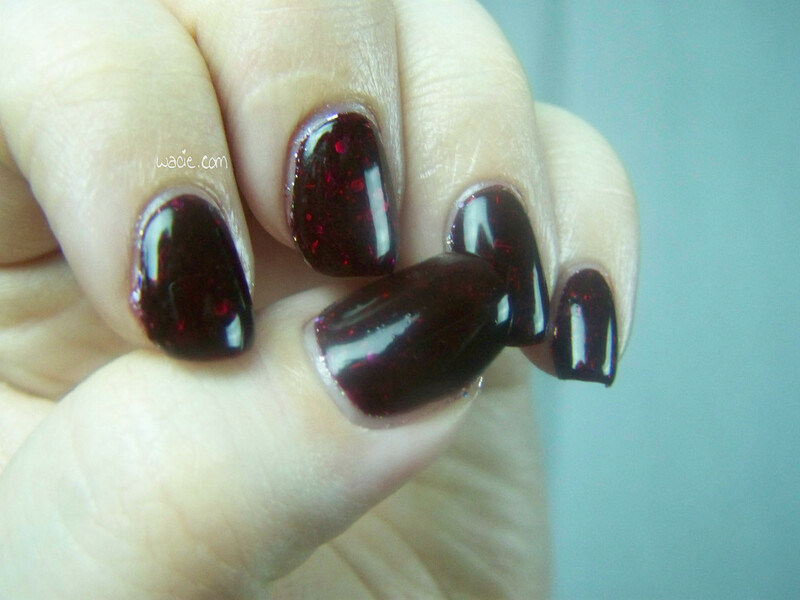 With top coat, my nails just look like tiny little garnets. 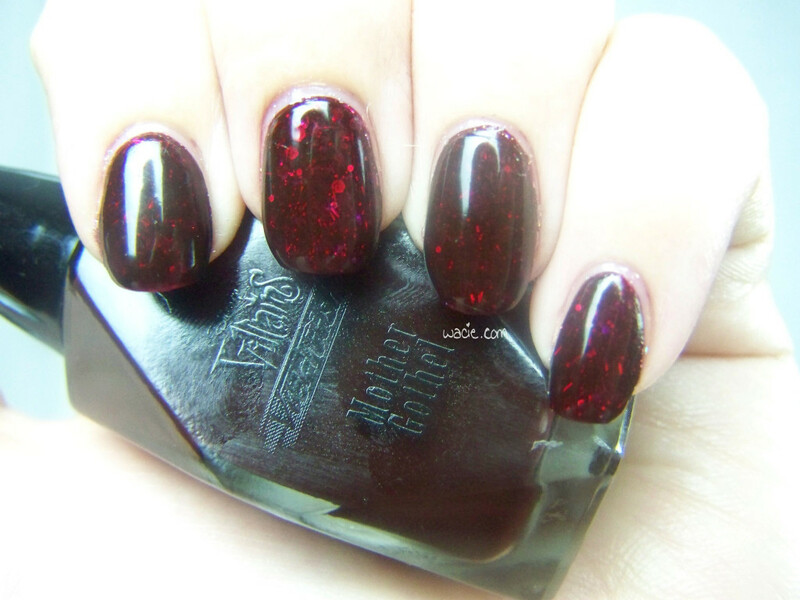 OPI’s Which is Witch? is special to me because it’s one I had my friend in New York send me. She has a local salon that sells OPI for half the price Ulta does, and even after shipping, I still paid less than I would have at Ulta. Also, I don’t even think I knew what this one looked like when she bought it; I don’t remember asking for it, and I think it was comparable to something else I was looking for that they didn’t have. 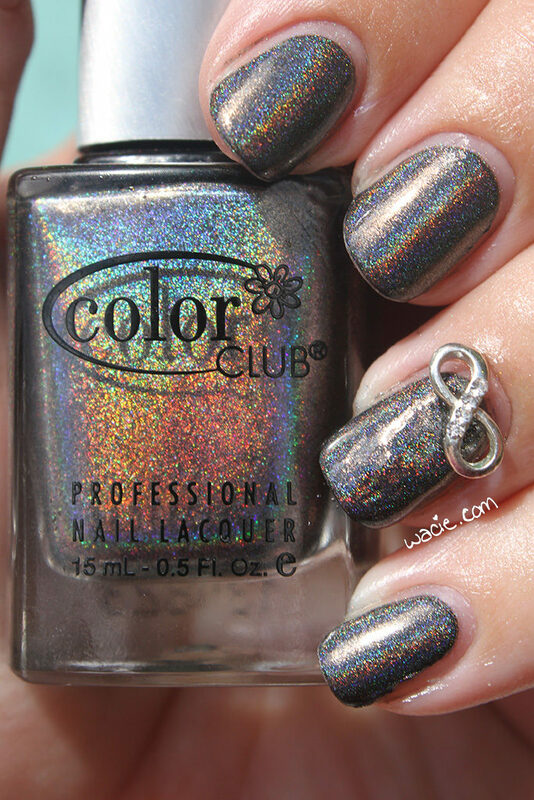 I love it, though; there are so many kinds of holographic silver glitter in it. A couple of the bar glitters didn’t want to play nice; you can probably still see a couple of them I couldn’t get off of my cuticles. Regardless, I am amazed at how this turned out. Note to self: do this more often.